Outcomes Manager from Vision enabled Greenwich CCG to effortlessly identify an additional 4,000 patients with long term conditions. In a cost-pressured NHS it was vital that the CCG identified these patients, not only to ensure that these patients received the most appropriate care as early as possible but also to secure the much-needed funds resulting from maximising available QOF points. 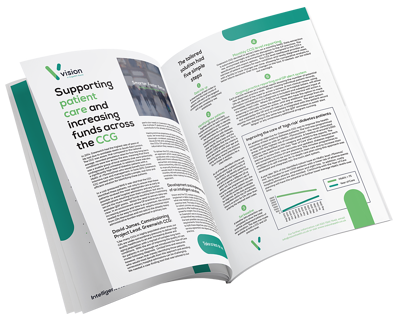 Vision and the CCG worked closely to build and implement a tailor-made solution that truly delivered what was needed, both at a CCG level and at an individual practice level. The basis of Vision’s state-of-the-art tool is to collect, process and analyse information from patients’ records to offer healthcare providers and commissioners powerful insight. Learn more about Outcomes Manager and download a copy of the case study today. Simply complete the form opposite to download a copy in pdf format.